As far as the people of ancient Pompeii were concerned, dead bodies and trash were basically the same thing, at least in terms of where they ended up. And that isn't even the grossest place Pompeii put its trash. When archaeologists first started excavated the legendary Roman city back in the 19th century, they were shocked to discover waste all around the tombs. The refuse included animal bones both charred and butchered, dog and horse remains, as well as broken pottery and building material. Some of these came from areas that had been preserved exactly as they were when Mount Vesuvius erupted in 79 CE, burying the city. The 19th century archaeologists assumed that this was a sign of a city in decay. Perhaps the earthquake that had hit the city in 62 CE had sent the city into a major decline, and so the garbage (not to mention all the graffiti) had simply started to pile up in the tombs while the city's inhabitants just tried to keep their city going. This theory, which endured for generations, was likely a result of the simple fact that it was completely unthinkable to these 19th century scientists that a city as civilized as Pompeii would see cemeteries as appropriate places to leave trash. But that seems to have been pretty much exactly the case, according to University of Cincinnati archaeologist Allison Emmerson. In the last fifteen years, new research has made it clear that Pompeii was still a major, thriving city in the Roman Empire after the earthquake right up until Vesuvius buried it in ash. As such, there's no reason to think the city had abandoned maintenance of its tombs. The cemeteries look just how they're supposed to look, and that includes the trash. 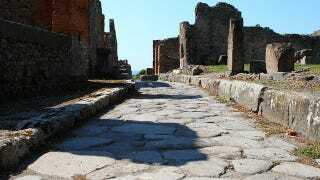 Part of this is a function of where the people of Pompeii placed their tombs. While we tend to place cemeteries in secluded, fenced off areas, the people of Pompeii would give their dead prominent placement in tombs along along the city's busy streets. That probably means a much more casual acceptance of the presence of dead bodies than we're now used to, and they seemed to take a similar approach to trash. "For instance, I excavated a room in a house where the cistern (for storing drinking water and water for washing) was placed between two waste pits. Both waste pits were found completely packed with trash in the form of broken household pottery, animal bones and other food waste, like grape seeds and olive pits." Emmerson says this is only coming to light now in part because early excavators simply couldn't countenance the idea of such apparent disrespect towards the death. She also says previous archaeologists weren't as interested in the possible cultural value of trash - to them, garbage was simply garbage, even if it was nearly two thousand years old. "In general, when a Roman was confronted with death, he or she was more concerned with memory than with the afterlife. Individuals wanted to be remembered, and the way to do that was a big tomb in a high-traffic area. In other words, these tombs and cemeteries were never meant to be places for quiet contemplation. Tombs were display — very much a part of every day life, definitely not set apart, clean or quiet. They were part of the 'down and dirty' in life." Via the University of Cincinnati. Image of Pompeii by Averain on Flickr.